We Offer a Range of Orthodontic Treatments To Bring Out Your Best Smile! At DelliGatti and Milewski Orthodontic Group we treat a range of patients from early intervention care in children through teens. Our practice works together to realize a shared vision of uncompromising excellence in dental care. To fulfill this mission, DelliGatti and Milewski Orthodontic Group is committed to earn the trust and respect of patients, profession and community. We strive to exceed your expectations for continuous improvement at all levels. Contact us today to schedule an appointment for a consultation. Invisalign® takes a modern approach to straightening teeth, using a custom-made series of aligners created for you and only you. These aligner trays are made of smooth, comfortable and virtually invisible plastic that you wear over your teeth. Wearing the aligners will gradually and gently shift your teeth into place, based on the exact movements your dentist or orthodontist plans out for you. There are no metal brackets to attach and no wires to tighten. You just pop in a new set of aligners approximately every two weeks, until your treatment is complete. You’ll achieve a great smile with little interference in your daily life. The best part about the whole process is that most people won’t even know you’re straightening your teeth. Click here to learn more about Invisalign treatments for teens. Phase I orthodontic treatment, also called ‘interceptive orthodontic treatment,’ refers to treatment that begins at an early age, and this ‘first phase of orthodontic treatment’ typically takes place when a young patient has both primary (‘baby’) teeth as well as some adult (‘permanent’) teeth present. If DelliGatti and Milewski Orthodontic Group recommends a Phase I type of treatment, it is for good reason, as such a treatment plan will correct a dental developmental issue and/or prevent a current dental or jaw development problem from becoming more severe. It is not necessary that all young patients have phase I or ‘early’ treatment, but for certain children, it is of great benefit. Typically, phase 1 orthodontic treatment is the first of two phases of treatment, and it occurs when a young patient is in need of intervention before starting regular orthodontic treatment, resulting in two separate treatment ‘phases’ or treatment plans. Orthodontic appliances, retainer-like devices, or partial braces may be placed to prevent a problem from occurring, correct a current problem or help to modify your child’s growth and dental development. There are a number of problems concerning tooth alignment, crowding and spacing, gum or periodontal health, jaws and facial development that can be corrected with Phase I treatment. It is common, but not always necessary, that a second phase of treatment will be needed after this first phase. Typically, the second phase of treatment is of shorter duration, reflecting the benefit of early intervention of the first phase of treatment. Learn more about phase 1 treatment. If needed, final positioning of the permanent teeth and completion of the bite correction will be determined and accomplished in the second phase of treatment. A small percent of Phase I patients do not require a second phase of treatment; however, most do need it. The goal of the second phase is to make sure each tooth has an exact location in the mouth where it is in harmony with the lips, cheeks, tongue, and other teeth. When this equilibrium is established, the teeth will function together properly. Phase two usually involves full upper and lower braces. 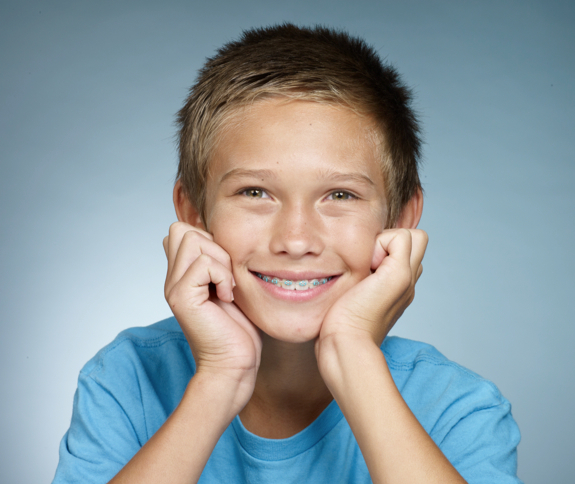 Learn more about braces by clicking here. Unfortunately over the years teeth will continue to move especially after the teeth have been moved into their desired positions. A period of time is needed to stabilize the teeth so that the surrounding bone and soft tissues can conform to your new dental alignment. You will want to protect and maintain your beautiful new smile. Our patients receive removable retainers after orthodontic treatment. We offer a wide variety of of retainers that can be customized to every patient’s wants and needs.